Peconic provides high quality and cost-effective ChIP-exo and ChIP-seq assays. Epigenomics, the science of gene regulation on a global scale, is rapidly growing and has been called the new frontier of biotechnology and personalized medicine. Understanding why and how genes are regulated has significant value in medical research, drug development, bioproduct development, and many other fields. ChIP-exo is a high resolution derivative of ChIP-seq, where an exonuclease is used to trim ChIP DNA up to the point of protein-DNA crosslinking. This is followed by next-generation sequencing to precisely identify protein-binding sites across any genome. While ChIP-seq has positional resolution of a few hundred bp, ChIP-exo resolution is on the order of several bp. The use of an exonuclease reduces contaminating DNA that can produce high background in ChIP-seq. ChIP-exo was invented by Peconic-founder and Penn State professor Dr. Frank Pugh and former graduate student Dr. Ho Sung Rhee. With years of experience performing and optimizing ChIP assays, we have developed effective and efficient ChIP-exo and ChIP-seq procedures. 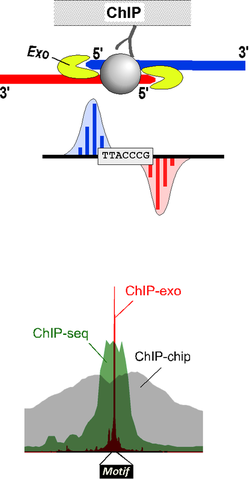 In fact, we provide both ChIP-exo and ChIP-seq data within each ChIP-exo assay. Assays we conduct provide high resolution data, helping our customers drive towards new knowledge and solutions. Our results are presented in an easy-to-use and interpret format, enabling our customers to quickly disseminate new knowledge. "Our goal is to help researchers solve some of the most complex biological problems that currently exist while reducing the financial risk associated with adopting new experimental procedures." From sample preparation to data construction, our many quality controls help us provide our customers with high quality data. However, as with any such lab technique, there is no guarantee that the DNA samples and antibodies are experimentally compatible. Our low-priced validation service assesses the ChIP-exo and/or ChIP-seq compatibility of submitted DNA and antibodies. Researchers then have the option to acquire the bioinformatics reports of their choosing. Our goal is to help researchers solve some of the most complex biological problems that currently exist while reducing the risk associated with experimental procedures. To learn more about the validation and data options, see Pricing. We have worked with many academic researchers throughout the world to create new knowledge in the area of epigenomics. Examples of publications that used our service can be found ​on the Publications page. Our end-to-end service streamlines epigenomic research for the research community. Results provided in an industry-standard format help in interpretation and publication. Per sample pricing is simple and straightforward.